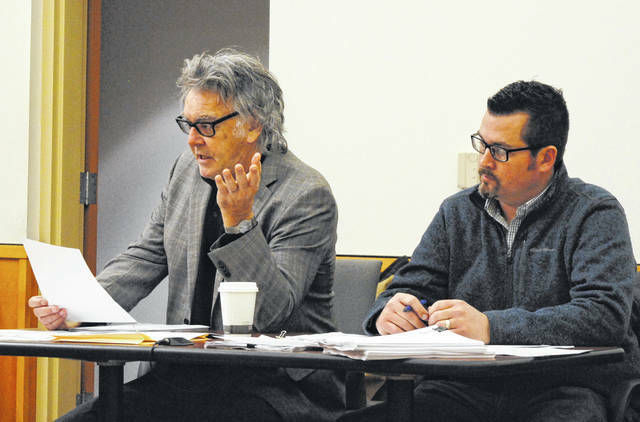 Hillsboro Mayor Drew Hastings, left, and Safety and Service Director Mel McKenzie are shown at a previous Hillsboro City Council meeting. After two years of discussion and debate, the City of Hillsboro and Paint Creek Joint EMS/Fire District have signed a contract that will allow Hillsboro to be accepted as a district member in three years, and the city’s fire station on North East Street will sell to the district for $720,000. Mayor Drew Hastings announced Monday night at Hillsboro City Council’s April meeting that both parties have signed the agreement, which stipulates that Hillsboro will continue utilizing Paint Creek’s fire and EMS services for the next three years at a price of $650,000 per year, and at the conclusion join the district as a voting member. Hastings previously said $650,000 was close to the millage equivalent paid by townships belonging to the district. When the city joins, a 5.5-mill levy will be put in place. According to Highland County Auditor Bill Fawley, agricultural and residential properties will pay the equivalent of 4.8 mills, and the estimated yearly tax will be $151.20 per $100,000 of valuation. The deal also includes details on the sale of the North East Street firehouse, which the district will purchase with rent-type payments that will count toward the final bill at the end of the three-year term, Safety and Service Director Mel McKenzie confirmed. As part of the agreement, the old Hillsboro fire station on Governor Trimble Place in uptown Hillsboro will be handed over to the city, McKenzie said. The safety and service director said the city has not yet determined what it will do with that building. The signing concluded a saga that began in 2017 when council began discussing joining the district as a member. After a number of failed attempts to approve the appropriate legislation, council voted to join the district in November 2018. But after the legislation was approved, Paint Creek withdrew its offer for Hillsboro to join after city officials said deed complications resulted in the property being taken off the market. Eventually, the deed issues were resolved, according to city officials, and the deal was inked. Council approved a final 2019 budget at its February meeting. “This new agreement takes the city and Paint Creek from sitting across the table from each other and ultimately sitting side by side, which is how it should be,” he said. McKenzie said he, too, is pleased with the outcome. McKenzie added that some citizens who argued the levy amounted to a “double tax” were wrong. In prior discussion of the issue, some Hillsboro residents argued that a 1.5-percent income tax in the city was designed to pay for fire coverage and an additional property tax for fire coverage would be unfair. McKenzie previously said the tax was originally approved in 1978 to pay for the Hillsboro rescue squad, but was amended in 1986 to cover other general expenses, and revenue from the tax now accounts for 82 percent of the city’s general fund. The safety and service director previously said it would be “detrimental” if the tax was repealed or reduced.